This cookie is a variation on last week’s Cinnamon Toffee Crunch Cookies. I played around with the dough a little bit and sent half the batch to work with Jesse along with the cinnamon ones. What happened was interesting. People tended to take both cookies, but then settled into one camp or the other. The peanut butter verses the cinnamon cookie crowd. What happened to my buddy Dishboy Scott is an entirely different matter. Scott doesn’t much like cookies, and he strongly dislikes peanut butter, but for some reason he decided to try one of the peanut butter toffee cookies. Astonishingly, Scott didn’t spit it out. Instead he declared them quite good, and after that first cookie couldn’t be persuaded to try the other kind. Suddenly I began to see much more of Scott. Well briefly anyway. He raided my freezer one afternoon for “work cookies”. He came by to swipe a few pieces of pizza and headed directly to my freezer for “something sweet”, he carried Jesse’s work cookie leftovers home in a bag, and during strange times I find him in my garage freezer opening the now depleted bag of peanut butter toffee cookies. So much for Scott hating peanut butter, but once their gone I’m certain he’ll make many fewer brief visits to my freezer. 1. Set the rack to the middle in the oven and preheat to 350 degrees. Line cookie sheets with parchment paper. 2. In a large bowl or stand mixer bowl cream together butter, peanut butter, granulated sugar and brown sugar. Add the oil, egg, and vanilla extract and beat until combined. Add flour, baking soda, cinnamon, and salt and beat to combine. Add the oats, crushed chips, peanuts, and toffee bits and mix until incorporated. 3. With a standard (size 50) cookie scoop, scoop the dough onto the parchment 1 ½ inches apart. Bake for 11 to 12 minutes and let cool on the cookie sheet for a couple minutes before removing to a cooling rack. Repeat with remaining dough. Makes about 50 cookies or more. I stopped counting. Yum! Those cookies look phenomenal! Looking forward to meeting you in NYC at the Electrolux event! These cookies look great. I saw that you are coming to NY. Congrats on winning the Electrolux contest. What a great story! Dishboy Scott has a warm placein my heart. I have a package of Heath English Toffee Bits on my counter at this very moment . . . but not for long! Oh- and have a great time in NYC! These cookies sound great! I like peanut butter in cookies, so this recipe looks great. I'm all for peanut butter cookies. Have a great time in NYC. Hmmm you are coming on the edge of my neck of the woods huh? Those cookies would totally make me go off my no sugar eating habits I am trying to stay on...I love toffee anything! too funny ... i just made something similar but with oatmeal. i think i'll try these ... i love toffee in my cookies! It's official, you're obsessed with potato chip cookies :) Congrats on winning the Electrolux contest! Give me peanut butter cookies over chocolate anyday! This looks like a great recipe. che belli! chissà che buoni! Your cookies always look and sound delicious. This looks like another great recipe. Wait a minute, this story CAN'T be true...I...don't...eat...peanut butter cookies! YUM! Peanut butter cookies are among my favorite. They look amazeing! One more to vary in my cookies preparations!!!! Oh these sound wonderful.. how can you beat this combination of flavors? Probably cant eat justy one, Id bet. I'm not normally a big peanut butter fan... but peanut butter and toffee, now that sounds like a winning combination! What is the purpose of the potato chips in this recipe, if I leave them out would it effect the flavor or texture. Jackie you can't leave them out of this one. It won't work. 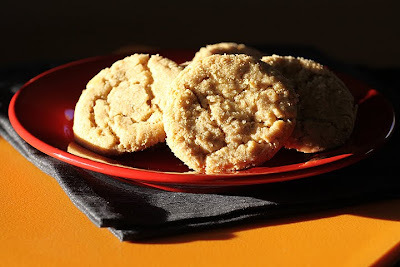 I have another peanut butter cookie recipe on my blog you can add toffee chips to if it helps. Just search for peanut butter cookies under recipe search. And thank-you for asking! I would have been sad if these didn't work for you. I am a big fan of your blog-your photographs are just beautiful! I have been ordering cookies from this company called Gifts Couture for over 10 years now and they are the most delicious home made cookies I have come across (and I eat ALOT of cookies). I was on their website which they just launched and I immediately thought of you-their cookies are so organic/homemade looking, and I think they would photograph really nicely.